You are here: Home / News / A paperless Congregation? We met with Fr. Agnelo Mascarenhas, originally from Goa but for several years now a member of the Jesuit curia. He is the Sub-Secretary of the Society of Jesus and as such very involved in the preparation of the General Congregation. 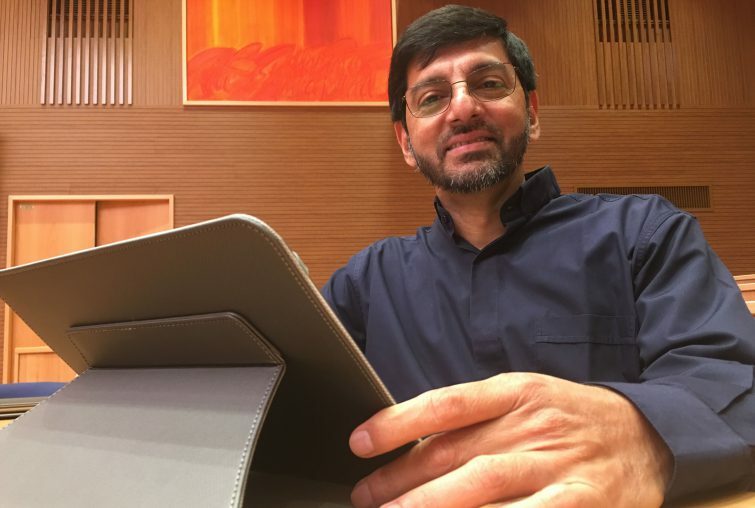 We wanted to know more about one of the most innovative aspects of this GC, the use of tablets in the aula by the members for the largest part of their work. Fr. Agnelo, where did the idea of using tablets come from? It came from Father General himself who was quite committed to the environmental direction the Society has taken over the past years, in relationships with our desire to live reconciliation with the earth. Could we organize a General Congregation that would radically reduce the use of paper? We look at alternatives and it became clear that the best strategy would be the use of electronic devices. Since we were rebuilding the aula, we also thought that it had to include a modern system for translation and for audio. We believed that we could answer all these challenges through the use of a tablet and some customize applications. What advantages did you have in mind? The first one, evidently, was to reduce the consumption of paper. It is working! We asked the members how many of them would want a paper copy of the De Statu report, the document on the situation of the Society that is more than 20 page long. Only 38 out of 220 people asked for it. Then, we wanted some gain in efficiency: the taking of attendance is done very quickly, by the push of a button on his tablet when the delegate arrives. More importantly, the electronic voting brings instant results on the screen. That brings a pleasant et even an entertaining aspect to the aula experience. Then we need less cable wiring, no microphones on desks, no wires for the translation equipment. What are the challenges that you have had to overcome? At first, we wanted to use the microphone of each tablet as the microphone for public intervention in the aula. It didn’t work because there was a one second delay between the person speaking and the retransmission of his voice through the audio system. It was creating an echo that was quite distracting. We had to accept to use wireless microphones that are being passed around among the members for their interventions. And so we ended up with two wi-fi system in the room, one for the regular work including the voting and one for simultaneous translation. It means that if you are using the translation, when the moment of the votes comes, you have to switch from one wi-fi to the other. Another challenge was the fact that for a certain number of the delegates, it was the first time they had a tablet in their hands. It takes some adaptation and it is clear that during the first days. There are also some technical glitches in this system as in any new electronic system, but after a couple of days we could say that we had solved most of them. What about the “security” issues? Aren’t wi-fi systems vulnerable to outside intrusion? The wi-fi used for the translation is secured with a coding system. The voice of the translators cannot be picked up by other devices than the tablets inside the aula that have been specifically configured. In that way, it is more secure than the FM system we used before. Then, everything is going only through our own servers. Google, who set up the specific apps we needed, agreed that it would not be connected to any of their systems or servers. The tablets cannot get access to the internet. Is that an expensive solution? Taking into account the fact that tablets are intended to be used for translations, documents and safety reasons, we found that it was not only the best solution but also it was cheaper. At the end, the global expenses are far less than using paper and traditional solutions. Are you satisfied so far with your decision to use tablets? Yes, we are. There were a few tablets that had configuration problems, the users have some adaptation to go through, but there is some excitement in the air. It works well!